When you drive eastwards across France, you gradually become aware of a line of mountains in the distance and by the time you’ve passed Nancy, you’re in the beginning of foothills. The mountain summits seem to take on a blue cast and gradually, as you begin to ascend, you realise that you’ve entered a very beautiful mountain region: the Vosges. A little history. Napoleon declared war on Prussia in July, 1870. It was disastrous. The French army was poorly prepared and in the next three months suffered defeats which are marked on memorials in some French towns: names like Wissembourg, Froeschwiller, Strasbourg, Gravelotte, Metz and Sedan came to be remembered for French losses. In January, 1871, France surrendered. The new German Empire was proclaimed in Versailles in February. By the Treaty of Frankfurt, May 1871, France ceded Alsace (except Belfort) and most of Moselle to the German Empire. A new frontier was devised. In May, the départements of Alsace and Moselle became the newly-named Reichsland Elsaß Lothringen. The Treaty made provision for people to leave the areas and go to France: 125000 people did so. After that, those who remained lived under occupation, males being required to carry out military service in the German Army, civilians bound by laws enforced by German officials and the army. The natural frontier was the summit of the Vosges mountains. On the western side was France, minus Alsace, part of Lorraine and most of the Moselle department; on the other was Germany and the annexed regions. The watershed formed a natural boundary along most of the frontier as far as the Ballon d’Alsace except for the Donon region. 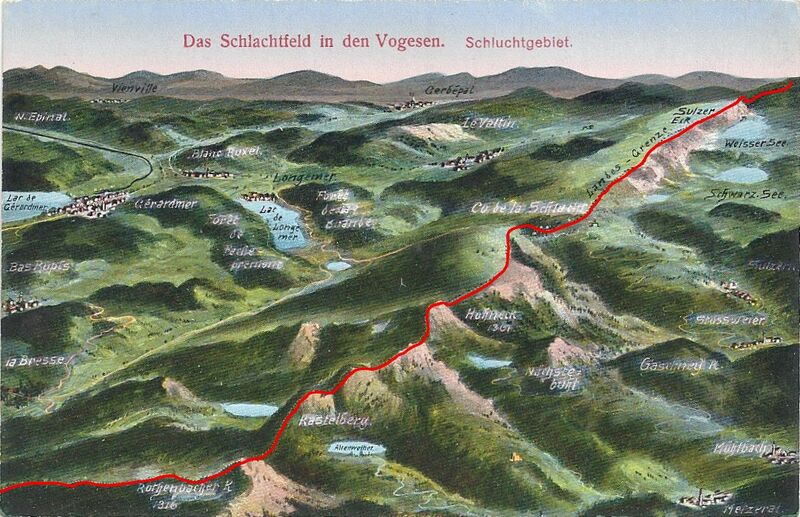 The crest line became known wistfully as la ligne bleue des Vosges. The lives of the inhabitants of the region changed markedly. Access through the difficult Vosges mountains was historically through a series of cols, which became part of the new artificial frontier. 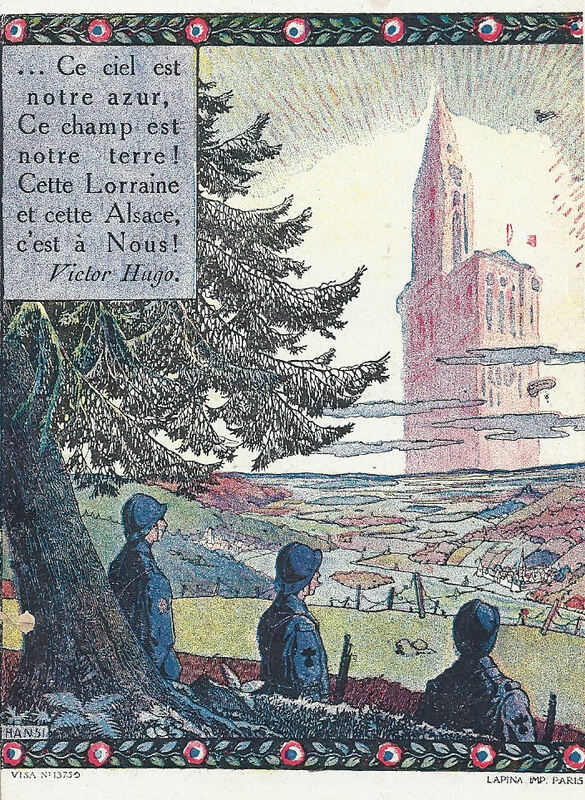 Customs officials of both countries patrolled the new border crossings between annexed Alsace and the rest of France. The German administration quickly erected poteaux frontières in the Empire’s colours, on striped posts displaying the German eagle in a circle. A long series of bornes frontières [boundary stones] was set in place and still can be spotted today. The stones are a reminder of one of the causes of the Great War. France wanted the annexed regions back. There is a valid argument that these regions historically belonged to Germany. However, I don’t intend to discuss that; there are plenty of good sources of information on the Internet. 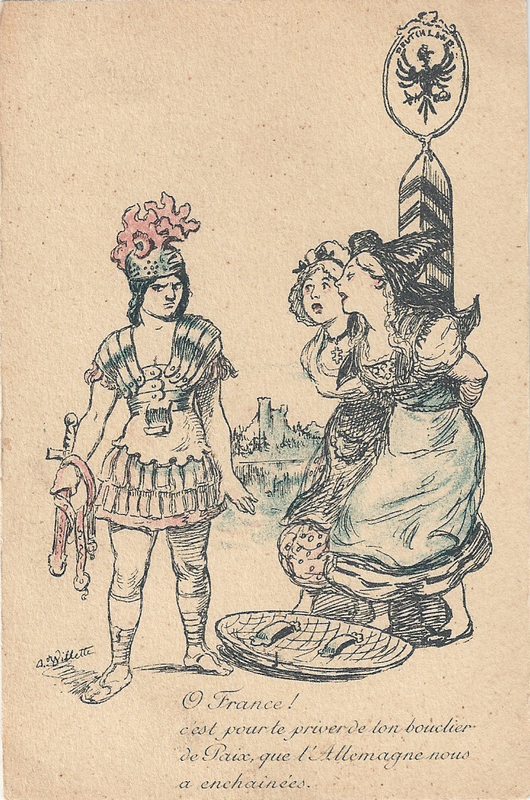 I intend to dip into the scenes of life in Alsace and the Vosges during the period before the Great War, using my own collection of postcards, maps and documents and my own photographs. I hope you enjoy them. Categories: A little history - the background and the early frontier | Tags: Alsace, Reichsland Elsaß Lothringen, Vosges | Permalink.